You are standing at the bottom of four(ish) levels of girders, connected by ladders. At the top is a pile of 12 barrels and scattered along the girders are toolboxes. 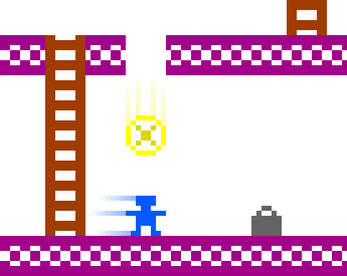 The object is to walk around the girders and pick up every toolbox while avoiding the barrels that roll down at you. You score 150 points for every toolbox you pick up, 1000 points for jumping over a barrel, and 100 points for each barrel remaining after you have picked up all the toolboxes. Source code for Hardhat Climber by Chris Lesher appeared in the January 1984 edition of Compute's Gazette magazine.